The vitamin and mineral supplement used in the National Eye Institute (NEI) age-related eye study (AREDS). Ocuvite? - the #1 recommended eye vitamin and mineral supplement brand among eye care professionals. 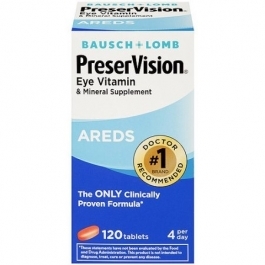 PreserVision was the antioxidant vitamin and mineral supplement used in AREDS. The age-related eye study (AREDS) is a ground breaking 10-year, independent study conducted by the National Eye Institute (NEI) of the National Institutes of Health. PreserVision is a uniquely formulated, high-potency antioxidant supplement with select vitamin and mineral levels in amounts well above 100% of the U.S. Government recommended daily value. SMOKERS: Please consult your eye care professional about the risks associated with smoking and using Beta-Carotene. ** Zinc Oxide is the most concentrated form of Zinc and contains more elemental Zinc than any other Zinc Salt (Zinc Sulfate or Zinc Acetate). Bausch & Lomb - committed to research and leadership in ocular nutritionals. Two tablets twice a day.